Please refer to our stock # 1005 when inquiring. 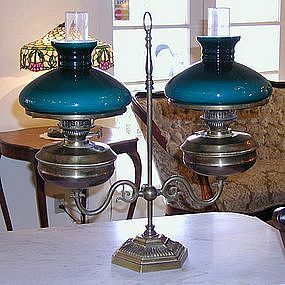 Lovely double student lamp, all original (not electrified) with brass base and green shades. Measures 24" tall x 20" wide. The only writing I can find is "Duplex Made in England" on the knobs that adjust the wicks. This lamp is in perfect condition.